Years ago, AllergyEats declared Disney World the “gold standard”” of food allergy dining. Today, we are taking the bold step of putting that same elite stamp on Great Wolf Lodge, a family of 12 indoor water park resorts across the U.S. (plus one in Canada). There has been an extremely positive buzz within the food allergy community about Great Wolf Lodge resorts, and food allergy families that are unfamiliar with these staycation destinations are taking note. They are asking questions on the various AllergyEats forums and social media about how well Great Wolf Lodge accommodates food allergies and the response from the community is generally ecstatic. Like many others, my food allergy family was curious about the hype, so we visited our nearest Great Wolf Lodge. Not only was our first experience sensational… but so was our second and third! Like many food allergy families, we’ve now become regular visitors. AllergyEats decided it was time to reveal the details of Great Wolf Lodge’s greatness in food allergy accommodations, so we sat down to interview Chris Hammond, the Corporate Director of Food and Beverage for the water park chain. Chris has worked at Great Wolf Lodge for eight years. For the first four years, he worked at their Concord, NC property, and for the past four, he’s worked at their Madison, WI, headquarters. 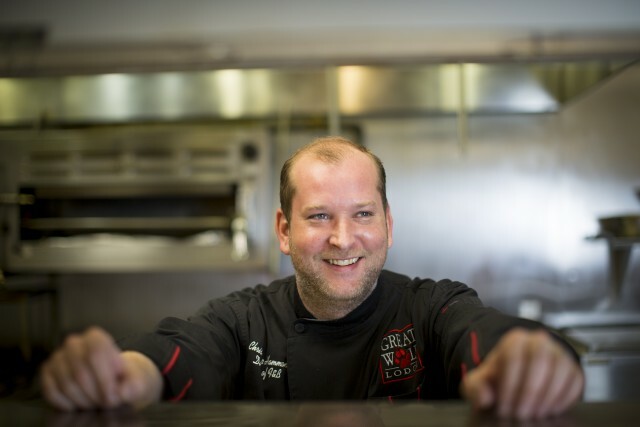 Chris is credited with pioneering Great Wolf Lodge’s exemplary food allergy efforts. CH: Every property started to notice that allergies had become a big issue with our guests and that these guests needed to be accommodated. I’m the one that circled it all around and made it a brand-wide effort. AE: Great Wolf Lodge has an amazing reputation in the food allergy community. What is your motivation? CH: The motivation comes from our guests. They’re the ones that need options and somewhere safe to eat. We had a choice. We could decide not to accommodate them and have them go elsewhere, which we didn’t want to do, or we could embrace the fact that we have a lot of families with food allergies coming here. We decided to embrace it. We didn’t want to just satisfy a child here or there – we wanted to make our food allergy protocols broader so we could accommodate all of our guests, regardless of their allergies. By doing so, we provide dining experiences aimed at creating guest meals that will all be fabulous and safe. AE: How did you create an allergy-friendly culture from scratch? CH: We began about four years ago. We went to corporate and looked at what each property was doing, then took the best practices and rolled it into one program across all of our properties. Nut allergies were the most common allergy at our restaurants, so we looked at how many items we had with nuts and decided it was possible to get rid of nuts altogether. We never used peanut oil to begin with, but we did have nuts in some other iems, like pecans on some of our salads. We knew we could change our recipes, and decided that we wouldn’t actively buy or use nuts on any of our properties. Some of the things we buy do come from manufacturers that process nuts, but those are usually in their own packages. We don’t have nuts on premises and we don’t have nuts in our recipes. Getting rid of nuts was a huge step for us. We just found other items to replace them with or we simply went without. Leaving nuts off salads was no big deal. Look at celiac disease – that was another big one. We do have our own pizza shop, and our kitchens have flour in them. We looked at how we were going to make items like chicken fingers or fried calamari, and knew we could use a different flour – chickpea or rice flour – instead of regular flour or breading. We decided to make all of our fryers naturally gluten free. Now, our calamari is one of our best selling items, and guests can’t believe it’s completely gluten free. Kids love our chicken fingers. We wanted them to be naturally gluten free, not made with products that are altered to be gluten free. AE: When you went through the process of becoming allergy-friendly, how was the buy-in from your various units? CH: Everyone has been on board with our allergy procedures, and every property has embraced it. AE: What type of food allergy protocols and procedures do you have in place in the front and back of the house? How does everyone on staff know about them? CH: If you go onto the Great Wolf Lodge website, there’s a link where you can send an email to communicate directly to the chef about your food allergies. Or guests can come in and speak to our front desk or restaurant staff. Regardless of the allergy, our protocol will always be that the server must speak to the chef or sous chef about the guest’s allergies personally. Then, the chef or sous chef comes out to speak to the guest directly, asking what they like and what they haven’t been able to eat at other restaurants. If we have a child with food allergies who never gets pizza, we can make them a pizza. That chef or sous chef is the only person that handles the food-allergic guest’s food. They don’t go back to the kitchen and ask someone else to handle it. We don’t put food allergy meals up in the window with the other food, and no one else touches it. That chef owns that meal until they personally bring it back to the guest. AE: What about equipment in the kitchen? CH: We have worktops that are specified as allergy-friendly worktops. We use colored cookware for allergy-friendly meals, and use allergy kits with purple spatula, knives, etc. to designate allergy-friendly equipment. If a guest wants a certain allergen-free dish, we have multiple burners and enough space to make their meal away from their allergens. We don’t cook all pizzas in the same oven. And our fryers are dedicated gluten, nut, egg and dairy-free. AE: How many chefs do you have on duty at one time, who are trained and educated about food allergies? CH: There’s always a chef or sous chef and culinary manager onsite. At any given time, we have at least 3-4 people – sometimes more – that are capable of handling food allergy meals. Every day, each property has many requests for food allergy meals. Our priority is the safety of these meals. We’re very upfront and guests understand this, and they are more patient knowing their food will be made safe (though our meals are still generally delivered quickly). Since our fryers are naturally gluten, nut, egg and dairy-free, if a child with these allergies asks for fried foods, it doesn’t take any extra time to prepare them. We keep things as clean as possible. What’s unique about us is that if you have multiple allergies, we can create meals that meet your needs, regardless of whether your allergies are common or uncommon. AE: So let’s talk about multiple allergies. How do you accommodate multiple and/or obscure allergies? CH: Because we’ve embraced being allergy-friendly, and with the amount of training that we do, we know that we’re solely responsible for our guests having a safe and great meal. We take our time to accommodate them. If you have 10 allergies, we’ll work with you to create a safe meal. If we know that a food-allergic guest will be here for three days, we’ll plan ahead. While they’re having dinner, we’ll ask what their favorite breakfast is so that we can be prepared come the next morning. AE: What kind of food allergy training does your staff receive? How often? CH: In terms of training, Russ, our culinary director, and I spend a great deal of time with our chefs and sous chefs on allergies. We’re always talking to the team about it, and staying proactive. We have an open forum and do a lot of food allergy education with the staff. While we can accommodate any food allergy, we don’t go into the non-Big 8 discussion with the line level staff. We want our staff to be knowledgeable about food allergies, but we don’t want to get to the point where anyone other than the chef and sous chef are handling the food allergy meals. We always get the chef involved. As much as other staff members could handle it, we just want to make sure that our chefs own the food allergy meals. We want the chefs to own the process and ensure that everything has been properly handled so there is no risk. When people are here, we don’t want them to come into contact with their allergens. AE: Do servers get training beyond knowing to turn over food allergy orders to the chef? CH: Yes, they go through the same education process as the line level staff. We want them to speak intelligently about food allergies, but we don’t want them to handle the food allergy orders themselves. We want to empower them and make them knowledgeable, but we want the chefs to handle every allergy order personally. All our training is internal – it’s all Ross and me leading the training. Yet, our food allergy training is constant and ongoing. We travel about 40 weeks a year, visiting all of our properties and training our staff. We’re making sure they have kits in place, that they’re in good shape, and that communication is constant. AE: Do you carry any packaged products as a back-up for food-allergic guests? CH: Yes, we always have prepacked foods for our food-allergic guests. We use Enjoy Life allergy-friendly cookies in the rooms – that was our mid-winter and spring partnership. At all properties, we have our standard food, but we do have individually-wrapped allergy-friendly products, such as Udi’s rolls. We have individually packaged cereal, such as Cascadia nut-free prepackaged granola. Allergy-friendly pasta comes in individual packages. We like individual packaging for food-allergic guests because we only open them one time, so there’s no risk of cross-contamination. We need to make sure our guests and their parents are comfortable that the food is safe. We will never go past the parents’ level of comfort. Sometimes they’d prefer knowing that their child is eating a pre-packaged Udi roll. AE: How many Great Wolf Lodge resorts are there? CH: We have 13 company-owned locations. Only one location in Niagara Falls, Canada is a franchise. More families are coming to Great Wolf Lodge because of how well we can accommodate food allergies. We love the fact that we can take care of all families that visit. There are so many kids with allergies coming to our properties. Sometimes we ask a dairy-allergic child if they’ve had pizza, and they haven’t had it in 4 or 5 years. We can give them pizza or whatever they want. We have guests coming in who are allergic to dairy, egg, soy, fish, and many, many other foods. We have areas in the kitchen that are designed for food allergies, and we can accommodate them all. We have allergy-friendly products like egg-free waffles. We have vendors that are extremely allergy friendly, like Divvies, which is dairy and egg free. We always have plenty of allergy-free foods. AE: Roughly what percentage of your dining parties have allergies or special dietary needs? CH: It’s never all at one time, but roughly 25% of our guests have food allergies or other special dietary needs. And if someone says they’re allergic to something, we consider it to be a serious allergy. If you say you’re allergic to mayonnaise, we consider it a real allergy, even if it’s really a preference and you just don’t like it. We don’t judge – we take people at their word. If they say they’re allergic, we treat it like an allergy. For the most part, everything is made from scratch. If you say you’re allergic to garlic, it’s no big deal because we didn’t pre-make the dish, so we can leave the garlic out of your meal. If you have an allergy and we’re serving pancakes or waffles, they’re made from scratch, so we can create these items that are free of your allergens. AE: Disney World is considered the gold standard, in terms of accommodating the food allergy community. They’ve shared their numbers, and have seen an incredible surge in food-allergic guests. Do you have any statistics on the growth of food-allergic guests at your properties? CH: I don’t have concrete statistics, but I can tell you it’s grown. Ten years ago, we maybe had a few allergy requests per week. Now, it’s every day. We are getting a lot of guests with food allergies. We’ve found that the culinary environment as a whole has changed. People cook at home more; people today know what they want to eat. They want to get exactly what they want at restaurants. They ask for substitutions and changes. Many restaurants want to accommodate their guests’ requests, whether it’s for allergies, intolerances or preferences. It’s much more acceptable today to ask for changes in the food. Restaurants need to be accommodating, but not all restaurants have bought into this yet. For Great Wolf Lodge, we’re great at accommodating food allergies, but it’s more than just allergies. We strip out artificial colors and preservatives from our foods. Our mac and cheese is colored with turmeric, not artificial coloring. We use organic ketchup, organic juice and non-GMO fruit. We are doing what parents are asking for. They’re concerned about what they’re putting into their bodies and their kids’ bodies. Guests today are much more savvy and want to know what’s in the foods they’re eating, now more than ever before. We apply it in areas that make the most sense. We use non-GMO fryer oil, non-GMO potatoes, and organic ketchup to make our French fries. We’re not on a health crusade – we’re just offering a way for people to make choices that they feel is right for their families. AE: We’ve talked about Disney World being the gold standard for accommodating food allergies. When looking at Great Wolf Lodge compared to Disney, where are there major similarities and differences? CH: There are definitely commonalities between our properties and Disney’s. We both have an opportunity to increase the experience for food-allergic families. In terms of tending to the allergy and the expert handling of the food, there’s no difference between Disney and us. Neither Disney nor Great Wolf Lodge staff ever miss an opportunity to enhance guests’ experiences. The main difference is that there’s a shorter average stay at Great Wolf Lodge of 1.4 days on property. It’s more of a staycation option. People typically stay longer at Disney. When you look at other theme parks, many of them, such as Six Flags, are seasonal. They have a lot of young, seasonal employees and food vendors scattered throughout the park. Food allergies are more difficult to accommodate in that environment, and allergens are harder to contain. 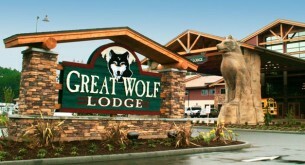 At Great Wolf Lodge, we have a scalable magnitude and a controlled environment. AE: What advice would you give to other restaurants who want to become more allergy-friendly? CH: I think the advice is either do it or don’t. If you’re going to do it, embrace it beyond belief. You have people’s lives at stake. When you are allergy-friendly, you’ll get families that are now loyal to you because you took care of them. You can’t just “kind of commit”. Once you commit to becoming more allergy-friendly, there are publications, websites, groups, and so much information out there. Be careful where you get your information, though. Some sites say oats are gluten free, which isn’t true, so you can’t accept everything as gospel. Do careful research. And you can’t take it lightly. If you do commit, and you treat food-allergic families well, you’ll have loyal customers for life. AE: Anything else to share with the food allergy community? CH: The most important thing that we can all do here is communicate. If there’s something that you need, let us know. The more you tell us, the more we can do for you. AE: And we recognize that it’s a two way street. It’s our responsibility to tell you about our food allergies. We have to be vigilant, inspect the food, and carry our epinephrine. As a food-allergic guest, we have certain responsibilities, such as communicating our allergies clearly to your staff. CH: Right. As a guest, you can’t be afraid to give us the full story. We want our guests to be honest. We want to know about your food allergies, and we take it very seriously. We recently had a family come in, and they had two kids with two different food allergies, and both kids ordered the same thing – cheeseburgers. When the chef delivered the food allergy meals personally, the father questioned how the chef could be certain these are the right cheeseburgers to accommodate each child’s specific allergy, and how do we know the right child is getting the right meal? We have rubber stamps saying “this meal is prepared specially for” with a space to fill in the guest’s name. We serve kids’ meals on paper, so the chef was able to stamp the paper, and write which cheeseburger was prepared for Samantha with the egg allergy, and which was prepared for John with celiac disease. It’s just one more checkpoint to make the guests more comfortable, and is a great tool if there are multiple allergies at the same table. By the way, if a guest isn’t comfortable, there’s no shame in saying so. We’ll never argue with someone. If they think this roll doesn’t look right, they should speak up, and we’ll change it until they’re comfortable. Guests have to be comfortable with what they’re eating. AE: Thanks so much, Chris, for sharing this information with us. We’re always happy to share information about allergy-friendly destinations, and we want the entire AllergyEats community to know about how wonderfully accommodating you are at Great Wolf Lodge. 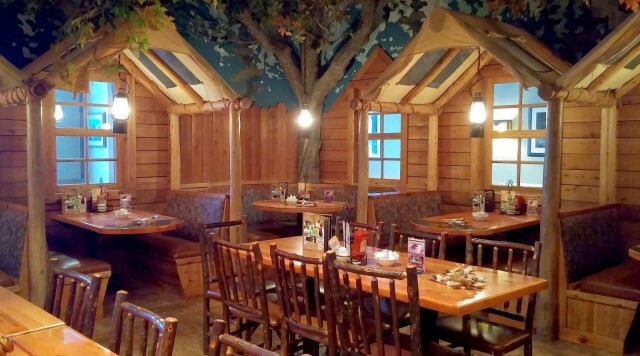 I truly believe that Great Wolf Lodge has become the “gold standard” of food-allergy dining at staycation resorts and may soon be held with as much respect as Disney World is today. And that’s saying a lot! So what do YOU think? Have you been to a Great Wolf Lodge? Do you have a glowing experience to share? Or do you disagree with my “gold standard” label for them? Are you more likely to take your kids to Great Wolf Lodge now? We want to read YOUR thoughts. Please share them below. Are they latex-free? My most severe allergy is natural rubber latex…which means that kitchen has to have been latex-free, not a corner, not for the day…some studies say daily cleaning for 6 mo. to remove all particles. Any balloons, rubber bands, duck tape, scotch that is not latex-free brand. We carry a cooler with hard boiled eggs, Mountain Valley water, cheese, apple juce, etc. for emergency meals. I do realize that swim suits in the pools will have latex but since I can’t go into a pool area, a separate eating area should suffice. Great Wolf Lodge is AMAZING! Our last visit was just in June, and not only did they have Enjoy Life cookies in the room, but the restaurant went above and beyond for our kiddo who has over 10 food allergies! They actually sent an employee out to the local grocery store to purchase a dairy/soy free cheese for him and made him an unbelievably delicious wheat and dairy free pizza! He can’t have beef either, so they also put turkey sausage on it! My son was beyond excited! LOVE Great Wolf Lodge! I’m sorry, I have to disagree with you on this. I recently stayed that the GW location in Grapevine, TX. I absolutely could NOT eat at GW lodge, despite my best efforts. My celiac disease was noted when we made the reservation, I called to confirm several days beforehand, and again at check in. There was no notation. The man at the omelette station kept using the same tools to make my GF omelette and everyone else’s (according to them, their omelette egg mix contains gluten). He didn’t speak english, so I couldn’t correct him. Nor could I find anyone to help. After those meals, I just gave up and ate my protein bars and take out from nearby restaurants. I did ask to speak to the hotel manager and was told she was too busy. I’ve tried contacting them via email and received no response. What you are doing to accommodate the population of people with food allergies is wonderful. I have three grandsons with nut allergy’s and every day is a challenge for their mothers. We will certainly look into a staycation at your Lodge. Actually we stayed there many years ago and loved it. Love to meet you and shake your hand. What about shellfish allergy? Do they have a separate fryer for all their shellfish items? This seems to be a problem in many restaurants. I cannot have anything that’s been cooked/fried with any type of shellfish/seafood. I noticed that the fryers were gluten free and such, but is there a dedicated fryer for the calamari. I have a seafood allergy and can’t have anything that has been fried in the same oil as fish and/or shellfish. I haven’t been to great wolf lodge, but I just wanted to point this out, so they don’t exclude this top 8 allergen. I’m curious about the shellfish allergy questions that were previously asked! Your hotel/park sounds amazing and we are super excited! Another mom of a kid with a shellfish allergy here. Just wanted to reiterate what the previous two commenters said. I will not let my daughter eat fried food at any restaurant with fried shrimp or calamari on their menu….and that includes the Great Wolf. I can’t believe they would go such great lengths to cater to nut/gluten/egg/dairy allergies but they make no mention of any accommodations for shellfish allergies. No offense intended toward the folks who have other food allergies and sensitivities. It’s great to take *all* of them seriously. But the severity of the reactions in seafood/shellfish allergies is on par with nut allergies but they rarely seem to be given the same respect. I stayed at the Pennsylvania location in March of 2015 and I thought they were ok as far as handling the allergies; but not nearly as great as Disney was when we visited this past March. Mayne they have improved since I was there. When I booked the trip I remember reading that I could email the head of dining to make them aware of my son’s allergies ahead of our stay, and I’m pretty sure no one ever emailed me back. Once we were there I do remember that when I’d inform the server of the allergies she was very attentive, but the chef didn’t come out and walk me through anything, etc like they do in Disney. So to compare my The Great Wolf Lodge with Disney in their efforts to make the dining experience great for kids with allergies, I would say it doesn’t even come close, in my opinion. Our family has a number of food allergies (all discovered in the last 5 years – including my own celiac diagnosis) so it has greatly changed our food prep necessities. This has been a BIG change for this OLD grandma who has been cooking for 46 years. I APPLAUD the job you are doing in this area! Just one comment — you mentioned using chick pea flour as a gluten free option. I might suggest you stay away from this ingredient as it can cause allergic reactions for peanut allergy clients. Even though you might think you are ok with using it in your gluten free fryer, you might be causing cross contamination for the peanut allergen. I found that out when trying to be sure gluten free family members were ok and I baked with chick pea flour and caused a reaction for my son who has a peanut allergy. The same thing could happen with calamari in the gluten free fryer because of the fish allergen. We went last year and because it was our first trip, we did our usual “bring your own foods”. I did speak to one of the chefs who took a lot of time to go over their procedures, how they would make a safe meal for my son and I was impressed. My hope is that our next trip we will try out a family meal dining out. I am extremely excited about the Enjoy Life Foods partnership with them! I applaud their efforts- but really think there is a lot of room to grow to be on par with Disney. That said, our first trip 4 years ago a girl at the ice cream shop refused to find out if there was dairy in the sorbet because “she didn’t want to go all the way back to the freezer to find out” – last year they were willing to check for me. At the same time, after multiple trips for ice cream over a 4 day stay, checking each time if they had anything non-dairy to sell me, I myself found divvies chocolate bars that nobody working there seemed to know they were selling. On that same trip last year eating in the restaurant twice once the server sent out a manager and all was well. The 2nd time she wouldn’t send out the manager and my son developed hives. So there is still room to grow, but they were trying and our entire family is still alive so it’s progressing which is more than we can say for most places. I believe that each location may need to be rated as separate entities because some perform much better than others. I stayed at Great Wolf Lodge in March 2012 and the moment I mentioned my allergies I was greeted with a chef who then came out with a beautiful allergen free dish. This was followed up with a review of recipes I had available for future meals during my stay. So I emailed a few recipes and a chef was assigned to prepare my meals based on the information discussed. It was AMAZING. Not often is a vacation so stress free and I could not be more grateful for that. I was there about 2 years ago to the Poconos location. There was not any visible evidence of food allergy information at that time. Also, I just did a search, and their website doesn’t have a whole lot (if anything) regarding their policies and what they have there. They may do the things they’re saying, but they need to advertise it better. They need a web page dedicated to their efforts in this area, food ingredient lists if possible, and information on their policies and how to successfully visit their restaurants with a food allergy (who will talk to you, etc). We just recently stayed at Great Wolf’s Poconos location. One thing that was done for my son who has allergies to milk, eggs and peanuts, was that when we ordered him a sorbet in the ice cream shop, not only did the worker go and get a “new” ice cream scoop, but she opened a brand new tub of the sorbet to ensure that there wouldn’t be a risk of cross contamination! This extra step was very much appreciated! At Great Wolf now and there was no chef at any meal to address my son’s allergies. Disney chefs spoke with us at every meal, buffets included. For us there is no comparison. Disney is head and shoulders above GW. I wouldn’ t even give GW a bronze never mind gold! Wow! Makes me want to come just for the food! We used to go to great Wolf Lodge all the time every year once a year with our children. Great to see that they’re becoming health conscious with their food! We don’t have food allergies but we like to try to watch what we put into our bodies to be healthy. It would be awesome to see you become the first waterpark without Chemicals in the water! With all the diseases out there chlorine kills the immune system really bad! They’re out our other alternatives you can put into the water to kill bacteria and germs one being iodine which if you research is lacking in most peoples diets and is great for our health! Every year after going to the waterpark with our children we would all get sick because chlorine weakens the immune system. This article made me so happy, but the comments with people’s personal experiences leave me worried. I hope the company will respond to them and let us know how they ensure that each separate location has the same great standards. I might consider a trip there if I am convinced that it is really safe for my child with Celiac. it seems everyone has had their own experiences with GWL. My family has not been there as of yet but we would love the opportunity to have a short get away with out having to pre food shop, plan and cook all of our meals. I would like to point out a couple of issues with many of these comments. First of all if your experience was 2 or more years ago I personally, would not consider it a valid review. Change takes time and 2 years can make a world of difference! Second, if your review was from a recent visit please give the location of the GWL you visited so others can be prepared as to what to ask for in accommodations with their food allergies or maybe even reconsider their trip there if the experience was extremely negative. We have enjoyed Great Wolf for years. I’m glad I read about the GF fryer because I have celiac. However, my son in peanut allergic and also very allergic to chick peas. The problem is, there are just so many possible allergens now! One good strategy we have found when eating out is to request special orders of chicken or steak grilled! We visited the Williamsburg Great Wolf Lodge in May. It was a good experience, but not as great as this interview sounds. Nobody told us there was a gluten free fryer! Or waffles! Or calamari! Or pizza! My 4yo would have been thrilled to eat chicken fingers, but we weren’t offered that option. There was no gluten free menu, we just had to ask and guess. We were served prepackaged muffins, still frozen. The gluten free cookies in the room were appreciated. The best meal was served buffet style — that was the only time I saw a chef (or any member of the kitchen staff), who graciously gave me a tour of the buffet and informed me which items were gluten free. A few of them surprised me! It was arranged nicely, with gluten free foods grouped together, so there was low risk of cross contamination by other customers. We had a nice visit overall, but they have a long way to go as far as training their restaurant staff and keeping allergic customers informed. We were resigned to a very limited food selection, just like most restaurant visits. It wouldn’t keep us from returning (because that’s our experience most places), but it wasn’t the kind of above-and-beyond service that would bring us back to Great Wolf Lodge over other great vacation options. we last visited the GWL in williamsburg 2 years ago and did not find it a good experience with food allergies. my 3 girls are allergic to eggs, peanut, tree nut, sesame and peas. the restaurant was out – no one was available to talk to us about the food options. the only place to eat was the pizza place and that was fine but certainly not up to standards covered above – and definitely not up to disney standards. i was so disappointed with their food allergy options i emailed a complaint but that was never addressed and no return response. i do hope that they have improved this much. i would be much more likely to return. In no way do I want to invalidate the unfortunately poor experiences many people are sharing in this comments thread. I wish that everyone would have a great experience every time (which unfortunately isn’t true at any restaurant or destination location – not even Disney World). However, I do want to point out that, where this post was shared on social media, the vast majority of comments (hundreds) were amazingly positive. Sure, there were still some bad experiences shared, but I want readers to know that it appears – and I believe – that the great majority of food allergy experiences at Great Wolf Lodge are positive. I say this simply to balance this thread of mostly negative comments (again, NOT to downplay them at all). We know that those with positive experiences are less likely to comment here than those who unfortunately did not see the great side of Great Wolf Lodge. I strongly stand by our claim that Great Wolf Lodge has achieved “gold standard” status. My family has never been to an indoor waterpark, I could never decide which one to choose! My son has a very limited diet. I know which park we will be choosing now, such a great thing they are doing! I thought camping was going to be our only vacations because I can provide all of the food. Now we will definitely check out Great Wolf Lodge! Unfortunately, our experience was nothing like you described in the article. You really should rescind that gold star rating. It is very misleading. Dining at Great Wolf (Wisconsin Dells) is not anything like dining at Disney. We ate the Lodge Wood Fired Grill on August 22, 2016. I told the waitress we had food allergies. She asked what the allergies were (peanut, tree nut, dairy and egg) and said my son could have the spaghetti and meatballs without the meatballs (after I questioned if they had egg in them). She confirmed with the chef that the meatballs were not safe, but offered a side order of fries to go with the spaghetti. I asked her if the fryer was dairy and egg free (as she already stated there were no nuts in the kitchen). She said yes. Upon delivery of the food, she told us they “couldn’t get the dairy out of the fryer”, so French fries were no longer an option. I am perplexed how they could be “trying to clean the dairy out of the fryer.” Regardless of why it was contaminated in the first place, you can’t just drain hot grease, wipe out a fryer, put in new grease and expect to do that all in the time a meal is supposed to be served. I felt like I was being lied to on top of feeling very wary of how the process of ordering was proceeding. This did not follow any of the protocols you stated such as the chef coming to the table and making something special for the food allergic child. The chef was supposed to handle that order only and the server was not involved to avoid any mix-ups per your article. My son’s food was delivered by the waitress and was given dried out cut up carrots and celery along with a very small bowl of spaghetti with sauce. Luckily, I had packed him a hamburger because the serving size was so small and he was still hungry. There was no offer of a special dessert or even a follow up on how my son’s food was prepared. As far as the resort being “nut-free”, I will tell you that my boys found peanuts all over the floor in the waterpark. I also saw peanut M&M’s being sold in the gift shop. We were happy to find 3 packages of Divvies cookies in the ice cream shop. They were partial crushed and melted to the packaging, but we bought them anyway because that was the only special dessert my son could have. I never saw any other pre-packaged foods you described in the article as being available for food allergic families. I am glad I packed food for him or we would have had to go home. Our main reason for visiting the Great Wolf Lodge was because of your “Gold Standard” rating on food allergy management and that was so mediocre that even my 10 year old son asked me how close the nearest hospital was before he ate the food served to him. He even saw that the waitress/restaurant was not like Disney restaurant’s food management. I’m sorry, I’d love for this to be a positive review, but our experience was disappointing. Please, please, please review the Great Wolf Lodge by each location. No one even mentions the Kansas City one, and that’s our local (three-hour drive one way) one. I would love to take my child there again, but I would note that although our child had a great time, it was stressful for us, as the food-service manager even was woefully clueless about cross-contamination (it was so bad that he bought me a frou-frou coffee on the house because of the confusion) and we are more conservative when it comes to allergies while on vacation (I would say that the T-Rex cafe off-site was very accommodating, and the chef did come out to speak with us there, when we decided to go somewhere that was safer). So please, please, please edit this review by dividing out the locations so we can get true knowledge of the location. One great thing to end on — when the gift shop realized that the Mike & Ike’s were potentially cross-contaminated with allergens, they subbed out a gift of my child’s choice instead of food, and that was greatly appreciated, so at least someone was accommodating! So please provide a follow-up article that addresses these issues. Thanks! My daughter attended a birthday party at GWL in Fitchburg, MA this past weekend and while she had a safe meal and dessert it was a battle to make that happen. I had to call 4 times (I left 3 messages with no returned phone calls- I was explicit in all of my messages about my daughter’s allergies (peanuts, tree nuts, fish & eggs except when baked with wheat) and when the party was scheduled). The 4th time I called I was put through to a live person because I said that our family had been considering a family stay (true) but we were reconsidering given the lack of response to my calls. After speaking with the live person I did get a call back from a chef who assured me the pizza was fine and offered ice cream since the frosting on the cake contains egg. He did call me back – a day later than promised to confirm that they had ice cream she’d like that was safe for her. At the party my daughter’s friend, who has celiacs found a piece of regular pasta in her gluten-free pasta. Her mother also spoke with a Chef ahead of time and confirmed everything with several restaurant staff including the Chef I spoke with in the restaurant before the meal. Based on AllergyEats blog about GWL I was so excited to try it out. So while my daughter did have a safe (if mediocre) meal, I’m not impressed with GWL’s handling of food allergies. If everyone of their chefs have not gone through an extensive allergen training protocol then they cannot be trusted. The examples that I have read through in the comments should alarm Chris Hammond that his staff and company are NOT SAFE. I would be ashamed of what has transpired. Trying to compare what GWL does to Disney is laughable. Read a label GWL, read a label. To your point, Nick, ndividuals who are most likely to comment here are those who have had vastly different experiences than what we publish – not just this post, but across the board. And while no restaurant or facility (including Disney, or Great Wolf Lodge) gets it right 100% of the time, I would point out that comments about this post on various Facebook pages showed food-allergic families having positive experiences at Great Wolf Lodge roughly 95% of the time (and that includes negative experiences from before their current program was put in place). So while I am in no way trying to minimize the negative experiences that some individuals have unfortunately had, I want to be clear that the ratio of positive:negative comments here do not reflect the experience of the masses. To see more, go to the Facebook group “Dining Out With Food Allergies” and type “Great Wolf Lodge” (or “Great Wolf Lodge” and “AllergyEats”) in the search bar and fact check what I’m saying. Thanks. Yes! We stayed at the Anaheim one. They were so wonderful! We felt confident dining with my sons peanut allergy and had a tasty and wonderful sedum experience. The grand mound location is horrible! When I asked about accommodating celiac and dairy allergies I was told they had plain grilled chicken or salads with vinegrette dressing. Super exciting for little kids. Not to mention there is nothing they could tell me that my child with an additional egg allergy could eat. Now I find out 24 hours before check in that our room fridge won’t have a freezer (they told me when I booked that we would) so we can’t even bring our kids dairy free ice cream and gluten free cones. They don’t offer kid friendly allergy foods or treats unless it’s a nut allergy. They’re customer service is also horrible. I have not found Gread Wolf to be allergy friendly at all. The staff at their Grand Mound, WA location was completely uninformed and had no idea where to even find allergy info on their foods. When I let them know we had an egg and milk allergy, the young lady kept saying they had gluten free options. We had to leave the hotel and purchase food from the local grocery store. We stayed at the new Great Wolf Lodge in MN last night. I was excited to have options for my son who is allergic to peanuts, dairy and eggs. Well there were no options. This place should not be getting this much positive attention from Allergy Eats. The staff and chefs were clueless and not helpful at all. We were very disappointed. I understand this is an older article, so maybe things have changed. But it was because of this article that we decided to eat at Great Wolf Lodge at the Wisconsin Dells location tonight. It wasn’t awful, but it certainly wasn’t “gold star” worthy. My daughter has a milk allergy. The waiter told me they did not have a dairy free menu, but pointed out the gluten free options. What?? The waiter was very nice, but could not offer any advice, only said pick something and he would go ask the kitchen if it was dairy free. We never once saw a chef like Chris Hammond is claiming to be protocol, either before or after. The food came out and was served with everything else, and in fact last, which is not how I would have done it. We did see a manager, but only after my husband requested they send someone to the table to help us order. The manager’s advice was to stay away from anything fried, and our safest bet was a grilled meat of some sort. We mentioned this article and the claim that their fryers are supposed to be dedicated dairy free, they seemed perplexed and said no, they are not. But made sure to inform us that they are dedicated gluten free. It was disappointing because this article led us to believe that French fries would be an option for once, but it is the same as everywhere else. It seems to me that the GWL in Wisconsin Dells would be fantastic if you have a gluten allergy, maybe even “gold star” worthy, but it was nothing more than an average experience for us with a dairy allergy. On a side note, I will say the food was delicious. I would have to agree with the other comments about not having a great food-allergy-accomodation experience. We have been to the GWL at Grand Mound, WA several times – the most recent trip in the early spring of 2018. Although the rooms are reasonable for eating in, you are sort of captive to eating on premises – other options are reasonably easy to access, but really who wants to leave the water park for 2 hours to have an over priced mediocre meal nearby? Besides finding staff who were not knowledgeable about ingredients/options/procedures (and not really interested in finding the answer, let alone enthusiastic about it), we struggled with just the lack of ‘safe’ options. There is a large ice cream/treat shop and a pizza place that must be passed on the way to the waterpark. Yep, multiple times a day you are gonna walk your kid by triple scoop waffle cones and cupcakes with no ‘safe’ alternative option. “Do you have anything without dairy?” “uh ……… probably not, but I don’t really know.” End of conversation. We got that a lot … They did occasionally (not consistently) have a sorbet, though there weren’t any cross contamination precautions and none of the above mentioned prepackaged options were available. Fortunately, neither of my kids have life threatening allergens. And frequently it’s a delayed reaction – so a little cross contamination is gonna make them feel crummy a few days later vs. a vacation-destroying-ER-trip. Fortunately, they also really love instant noodles, bagels and oranges – which they can probably survive on longer than my stamina for waterpark fun 🙂 Unlike DisneyWorld, a visit to GWL is likely to be 24, maybe 48 hours long – most of us can come up with sustenance for that long. You are there for the waterpark, not the culinary experience. There is a buffet (where we found staff did not know of safe choices nor were they able to tell us what was in something like chicken finger breading or the sauce on meat). There is a sit down restaurant and room service – neither of which were we able to find convincing/complete answers to ingredient questions. There is also, within the waterpark, a limited menu burger&fries type place – if there are options there that will work for you, great; if not, you are probably just out of luck. There did seems to be reasonable accommodations/options for gluten allergy at most establishments. All that being said, GWL does have (relative to many other choices) great prep/cook in your room. With a fridge and microwave you can definitely plan to bring food, but maybe don’t plan on being able to eating out often. We are returning soon and hopefully things have improved.